"I just got results from recent ABIM 10 yr recert and I failed. I over prepared for this exam, studied daily for months, Harvard review course, analyzed over 1000 board type questions the week before, teach medical students daily. I have never come close to failing any previous board exams." Thank you for your recent e-mail to the American Board of Internal Medicine (ABIM). ABIM is entirely satisfied that there was no error in scoring your examination. The scoring process is a meticulous one. A rigorous set of quality control steps are carried out on every examination. Before final scores are approved, the reliability, validity, and fairness of the examinations are verified by the ABIM. ABIM will not release results until it is satisfied that a reliable instrument has been administered and data are accurate. Additional information about the way ABIM develops and scores its examinations is at ABIM's website at www.abim.org/about/examInfo/developed.aspx. Results of the rescore will be mailed to you within eight weeks of receiving your request. If you need further assistance, you may reply to this e-mail or call us at 1-(800)-441-ABIM (2246) Monday through Friday, 8:30 a.m. to 8:00 p.m., and Saturday, 9:00 a.m. to 12:00 p.m. EST. This scenario could happen to any US physician undergoing the American Board of Medical Specialties (ABMS) proprietary Maintenance of Certification program today. The hundreds of hours of preparation, survey collection, and timed test, all wasted. And since hospital credentials, legal credibility, and inclusion on insurance panels are increasingly requiring a favorable certification "status," the potential consequences to U.S. physicians are very serious indeed. This threat to U.S. physicians' ability to practice medicine comes at a time when insured patient populations have swollen. So why would such a "Maintenance of Certification" program be beneficial for American's? Is such a program really about assuring some definition of quality physician? Or might it be about something very different? "Qualified Maintenance of Certification" programs must contain surveys as part of their criteria4 despite their lack of scientific rigor. The current President and CEO of the American Board of Internal Medicine, Richard J. Baron, MD served as Chair of the ABIM Board of Directors in 2008 and as Treasurer of the Board in 2007 and later as a Trustee for the ABIM Foundation while also serving as the Group Director, Seamless Care Models, at the Innovation Center at CMS. The former President and CEO of the American Board of Internal Medicine, Christine Cassels, MD, left the ABIM to join the National Quality Forum, another "consensus-based entity," and also had significant conflicts of interest with the group purchasing and performance improvement firm Premier, Inc and Kaiser Foundation Health Plans and Hospitals which she later relinquished. Despite these conflicts, she retains her current position. 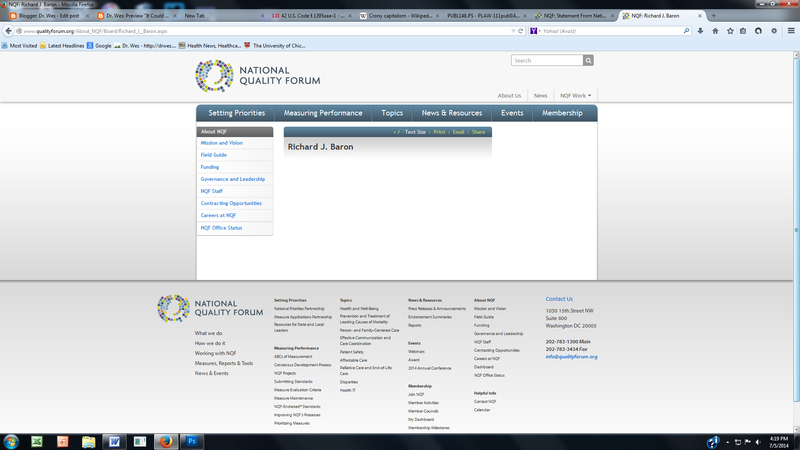 An unfinished public webpage (Here's a backup screenshot in case this webpage disappears) raises speculation that current ABIM President and CEO, Richard J. Baron, MD might be slated to sit (or may currently sit) on the National Quality Forum's Board. Crony capitalism is pervasive in Washington, DC and nowhere is this more evident than the American Board of Medical Specialties and the American Board of Internal Medicine incorporation into our new health care law. The conflicts of interest contained within the Affordable Care Act's requirement of Maintenance of Certification as a basis to assess physician quality are increasingly harmful to physicians. Given the conflicts of interest between the American Board of Internal Medicine, National Quality Forum, and the Center for Medicare and Medicaid Services, paired with the growing Maintenance of Certification failure rates of physicians without a clear explanation, the specter of cost control at the expense of patient care must be considered. Only by understanding the environment of government cronyism and regulatory entrapment created by our new health care law can physicians begin to address these very real concerns for patient care. Thank you so much for another excellent article on MOC. To physicians who did not pass this stupid test: PLease learn from my experience and do NOT pay them any more money for re-score. I paid additional $250 for re-score and got a generic response in 8 weeks (which was past the deadline to register for next test). ABIM sends a generic response that they never make a mistake!! as follows"
Dr Wes how can i send you an emaill? MOC as it stands now, does not guarentee anything except they passed a test. I've seen board cert'ed docs make mistakes. $$$ racket. If they find another way to see that docs stay up to date, fine. However, this method doesn't mean docs are up to date and I and other patients have seen it first hand. Doing an excellent H&P, being able to understand basic bloodwork, those are some things I want to see them pass a test on. I've been able to out do a number of them with medical research because they didn't know how to do something or resort to u/s, MRI's, etc. when they are NOT necessary. Yes, even with my reading, I can figure it out. If I ask the background and can't get it, and I can produce those figures, yes I can figure it out. Crony capitalism, regulatory capture? For sure. On the other hand, there is a silver lining in re-certification failure. Hopefully you have a good disability policy. One can now legitimately claim cognitive decline in the form of short term memory loss and punch out of this South African diamond mine of a job. The only test you would have to "study" for would be a neuropsychological one. Then develop a new cognitive skill set while your bills are paid. Moral issues can be addressed to the ABIM or federal government. Please correct me if I have misread the regs and/or overlooked critical sections. "additional incentive" payment and it not required for regular CMS payments. Of course that is bad enough.The way some of those sections are written, they could have been composed by folks at ABIMF and I suspect may have been. I love your blog and am very grateful for the time and energy you put into writing these excellent posts. One suggestion I would make is to substitute the term "cronyism" for "crony capitalism." Wikipedia aside, the proper definition of capitalism is "the economic and political system in which a country's trade and industry are controlled by private owners for profit, rather than by the state. "[http://bit.ly/1qcxZ3L] Cronyism is actually the polar opposite of capitalism. To the extent that government is allowed to show "favoritism in the distribution of legal permits, government grants, special tax breaks, or other forms of state interventionism"[Wikipedia] is the same extent that capitalism is absent. Until we have clear, precise use of terms, we can not have clear and meaningful discourse. What so many people hate about the US system is the cronyism which they erroneously equate with capitalism. It's actually "government cronyism" but "cronyism" alone should suffice. Thanks for this post on your blog. I have questioned the American Board of Family Medicine about this same issue and have gotten the same response. What are ways to circumvent this situation? Failing exam is okay. But the problem is not knowing what did you do incorrect so you can improve next time is soooooo frustrating. I also failed. I called and requ stead for ABIM to call me and explain. She ( from ABIM, rude and full of attitude) mentioned I will most likely pass next time as I was very close. She said each question has different weight and it’s possible the question I marked incorrect, had more weight. They clearly tell you that rescoring has never ever worked in past in favor of physician. I think this entire system of way they take exam is wrong and must go away. I am taking exam again as I have no option. They are fake. How Much Physician Anti-MOC Sentiment Is There?